As anyone who’s spent time in the company of a bawling newborn will know, babies are complicated little creatures. That, essentially, is the premise of Theatre-Rites’ brilliantly simple new show for three to six year olds. Sweetly, amusingly, unhurriedly, Beasty Baby offers a series of snapshots of everyday life with these (sometime) bundles of joy, lurching from the adorable to the maddening and back again. 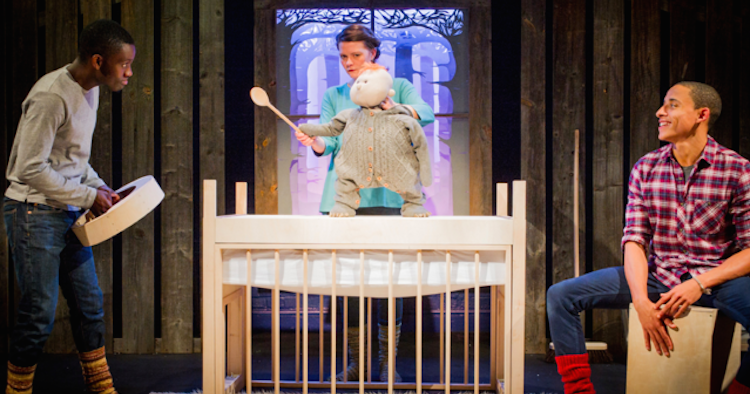 The baby in question is a handheld puppet, deftly manipulated by Theatre-Rites’ cast of three. Isolated in the middle of a wintry landscape, the trio suddenly find themselves landed with this temperamental infant’s care and do the same as all new parents: make it up as they go along. They cradle, they sing, they even do acrobatics trying to keep their new charge happy. As time passes, the unpredictable sprog throws up new challenges, with the grown-ups forever running (often quite literally) to catch up. It works, then, for adults as much as for kids. Little ones giggle at the cheeky demands of the tiny tyrant, while parents make noises of weary, affectionate recognition. While little really happens, cycles of repetition and change keep the show moving forward, often driven by the seamlessly incorporated live music. Routines are established, repeated and disrupted, accompanied by a playful soundtrack. It’s all carefully calibrated to the attention span of its target audience, while achieving the double feat of keeping us bigger kids captivated at the same time. Simplicity and clarity extend to every area of the production. The Ikea-esque wooden furniture of Verity Quinn’s design unfussily evokes both home and obstacle course, while there’s a fairytale glow to the landscape of trees and snow beyond the set’s single window. Days melt into nights melt into days again with the aid of Chris Randall’s lighting and the company’s graceful choreography of daily rituals: playing, feeding, burping. Change, as so often in life, sneaks in slowly. It might not sound like much, but the skill of Sue Buckmaster’s deceptively straightforward production lies in finding both the sublime and the ridiculous in the familiar acts of child-rearing. Over the course of one long night, performer John Leader’s attempts to lull the mewling baby to sleep become a sort of dance, as he tiptoes, pirouettes and eventually levers himself athletically into the cot, infant in hand. The baby itself, meanwhile, is a brilliant comic creation, given cutely gabbling voice by Sian Kidd. As infant becomes toddler, both the noise level and the laughs increase, the naughtiness striking just the tone with the young audience. In the end, though, the beastliness turns out to be worth it for the beauty – especially in the gorgeous, utterly enchanting finale. Beasty Baby is, ultimately, a celebration of all the chaos wrought by the arrival of a little one, animating for parents and kids alike the complicated joy of what it means to be a family.